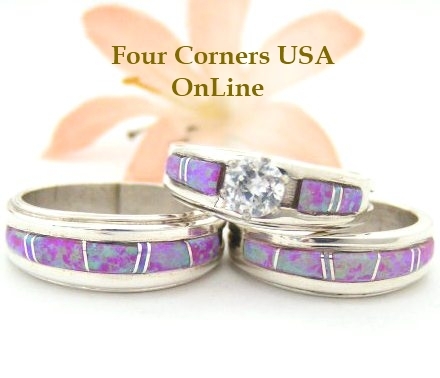 Pink Fire Opal Inlay Band Rings by Native American Navajo Silversmith Wilbert Muskett Jr. Mr. Muskett offers a traditional style Band Ring with raised channel inlay each individually hand made. These beautifully designed jeweltone Pink Inlay Band Rings are not only great fashion rings but also visual statements of Breast Cancer Awareness, Support and Survival. 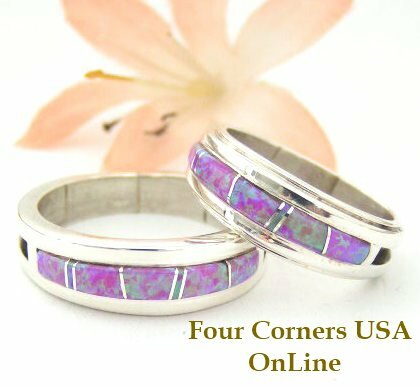 Native American Pink Fire Inlay Band Rings are a wonderful replacement Wedding Band Rings, Anniversary Gifts, Commitment Rings or just signs of affection and alternative option to traditional or socially expectant Wedding Rings and a true expression of your personal style.